Hey, hey, hey, do you know what day it is? uh? uh? It's the day when a round of the most creative, smart and trendsetting bloggers show us their latest and favorite projects. So as not to overwhelm you, the progressive tour has been divided into several a day, through out this week, August 5th-9th, with a roundup next Monday. Grab your favorite sippy cup, take your time, browse, learn, tweet, share, pin it, and best of all, connect with some new bloggers and have fun. I use new and old fabrics, satin type and gauzy type that would fray. No 'fray check' on these....I want them to fray! :) Sometime ago I acquired a 1920's trousseau piece. It was stained and torn and ragged but had the most gorgeous hand sewn laces and appliques and rosettes on it. I salvaged those for use on the bracelets. On my treasure hunts, I am always on the look out for bits and bobs....anything I might use later on my journals, bracelets, necklaces, etc. I covet the old 'faded to a divine creaminess' pearls and rhinestones with their aged darkened patina. On this bracelet I used some vintage crocheted buttons. I use cotton flannel as a base for the bracelets, just pinked on the edges and everything is sewn by machine or hand....no glueing. 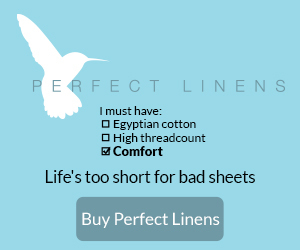 The cotton gives them more stability and it's so soft on the skin. You can see a portion of one peeking out from the soft green bracelet. There's a list below of all the bloggers on tour. 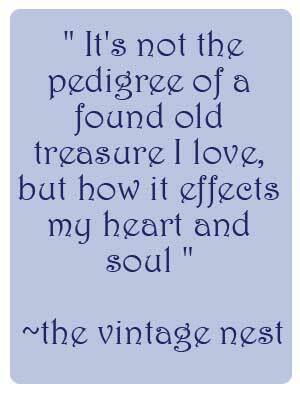 The Vintage Nest is on Thursday. I hope you will visit them, greet them, and leave a comment. It's a wonderful way to grow your followers and meet new ones too. 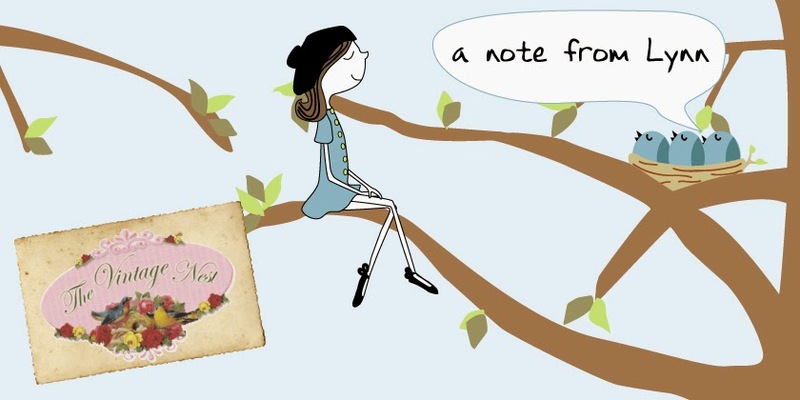 I'm looking forward to a fun week of touring blogs! Your bracelets are so beautiful!! I'm marking my calendar now for your November show. I will be checking these blogs. By the way, this bracelet is fabulous! Your bracelets are charming, but your fabric frays, not freys. Lynn, I love these, so romantic and girlie! I read it twice, did I miss where you got the gold end clamps? I am so excited that you are doing a craft show, you must have found someone to help!!! I am going to do the Fancy flea again November 2nd...Yep. I have help!! Oh Lynn, the bracelets are gorgeous. I want to come to Richmond to shop the show. Architectural pieces and feed sack stools. Love it. You have me hooked. Oh my goodness -- so beautiful and I've never seen anything like these! Good Morning Lynn, The bracelets you have made are beautiful.... I feel the name bracelet is just too plain a name for them, they need to be called something like "pearl and lace adornments" because they really are so lovely. Oops, I forgot to say, that I found your blog at No Minimalist Here and I have enjoyed my visit so I have become a new follower. I would like to invite you to visit me at Ivy, Phyllis and Me! when you have a moment to spare, as it would be lovely to see you there. Your bracelets are just beautiful! I love the choices you have used to create such gems. I'm behind but I'll have to check out all of the talent being showcased! These are just beautiful!- wish I lived closer to Va to attend the show-lol-would love to wear one on each wrist as cuffs with a beautiful ivory blouse ! Visiting from the tour and now following! Lynn, these are beautiful. I wish I could make bracelets like this. My wrists are super small and I can never find anything cute. I'm glad we are on this tour together! Lynn ~ these are absolutely beautiful and exactly my style. Lovely handwork. I am so glad to have met you through the tour. Lynn, The bracelets are beautiful and I admire your creativity! I know these will sell quickly. Thanks for linking to the Open House party. That soft pink book cover is the perfect background for your lovely bracelets. Happy Pink Saturday! I LOVE your bracelets Lynn! They are so charming and nostalgic in a up-to-date way. Very nicely made. They'll be a sellout for sure. It's really fun to rework vintage jewelry that could go by the wayside. I like to give it a new life. Thanks for your kind words about my creations. I find it very rewarding. I'm looking forward to checking in everyday to meet new people and see new things! What a great idea Lynn. PS love hummingbirds and your prev post is so sweet! What a brilliant idea - and I love how your bracelets are each so different. Just lovely! Happy Pink Saturday. Everything is beautiful! I'm going to be in Virginia this fall but I leave on Nov. 4. I'll just miss your event! Love the pearls! Your bracelets are amazing. You do such great work! Your bracelets are just fabulous! The lace and pearl one is calling for me! I wish you much success at the show, I know they will be snapped up in a hurry! THanks for sharing them, they are truly gorgeous!